Revue Roumaine d'Histoire de l'Art. 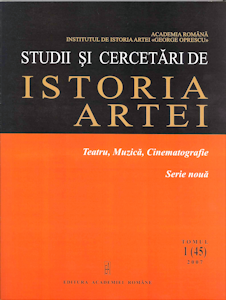 Série Beaux-Arts is a peer-reviewed open access journal published by G. Oprescu Institute of Art History under the patronage of the Romanian Academy. Read in the latest issue articles by Anna Adashinskaya, Emmanuel Moutafov, Corina Teacă, Constantin I. Ciobanu, Georgi Parpulov, Adrian-Silvan Ionescu.